I have been extremely impressed by Cambridge Solar. I am actually in the PV industry myself (but something specialised call BIPV and nothing to do with residential) so I was always going to be a relatively knowledgeable customer. Cambridge Solar impressed in many ways. First they were the only among 4 local(ish) suppliers who surveyed that actually got up onto my (flat) roof to establish the specifics including exact area available (which turned out to limit me to 3Kw). The others just looked at the roof from the ground and guessed essentially. The price from Cambridge Solar was very competitive but in no way has this meant ""low quality""...In fact I know I have good quality panels and an expertly installed system. Because it was the holidays for Owens team, and because I was constrained to a certain few days, Owen ended up being involved in the installation himself. Owen and team even identified and replaced several broken tiles while on my roof - at no cost, as well as a repair to my guttering......that's beyond the call of duty and certainly indicative of the genuine attentioncsnew.testspirit of customer care that most companies claim - but few actually deliver I suspect. I could go on....but basically I rate these guys at 6 out of 5. 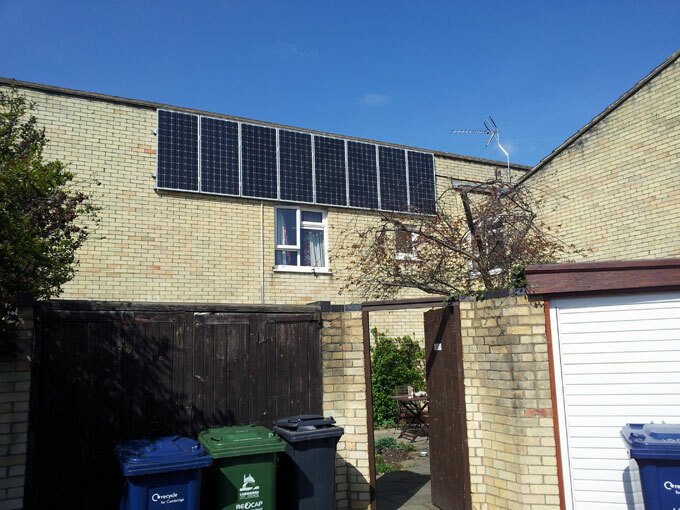 They were recommended to me by a neighbour and I have already recommended Cambridge Solar to 3 other neighbourshttps://www.cambridge-solar.co.ukfriends in Cambridge who have become interested after finding out I was getting residential PV. It was re-assuring to see the meter, and specifically that even at 5pm with a darkish overcast cloud cover I was still generating useful amounts of power. I wish Cambridge Solar the best and have enjoyed the experience of having them work on our house. I am very well satisfied with the 2 kWp installation. From start to finish very professionally carried out. Would recommend to anyone. I was really impressed with the service provided by Cambridge Solar. The whole installation of PV solar panels was completed within 16 days of my first meeting with Owen. The fitters and electricians were all extremely courteous and Owen could not have been more helpful in answering all my questions. I would certainly recommend Cambridge Solar! If you fear that solar panel companies might resemble double glazing salesmen, Owen and his team are the opposite of the image you might conjure up. Whenever Owen and his installers are in your house, they are quiet, intelligent, conscientious and respectful of your wishes and your home alike. They don’t invent false deadlines for you to make your decision, but believe in giving you all the information that you need to make choices that work for you with timing to suit you, and never tire of your questions. I would trust them 100% and only wish I knew more people considering solar panels so that I can save them from choosing the wrong company! I got two quotes, but it became apparent that the other company was not being realistic in their estimation of how much electricity I would be using and exporting, which skewed the projected figures. When you compare like for like, Cambridge Solar are very competitive on the costs, and you also get the pleasure of dealing with a great company who explain the product so that you understand it and can get the most benefit from it. I have a house with non-ideal East/West-facing roofs and I wanted a system split between the roofs. 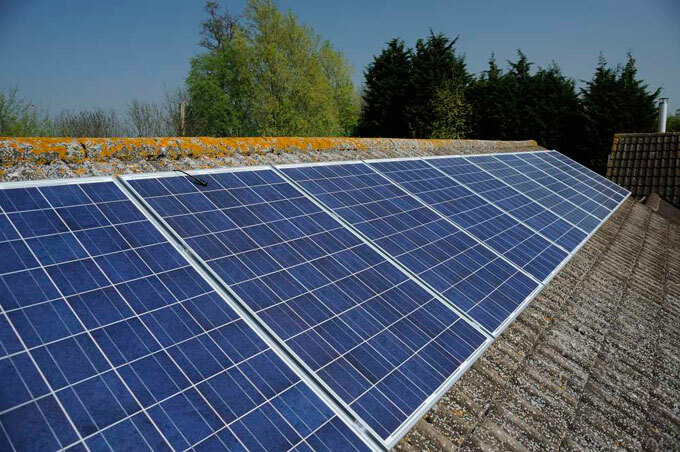 Owen was very helpful when fielding technical and regulatory questions during the design and evaluation phase and Cambridge Solar eventually installed a 3.68 kWp system comprising twin 8 Phono Solar panel arrays with a Fronius inverter. I found Owen to be technically knowledgeable and helpful during the evaluation process. Their installation team went about their work efficiently and with a smile, completing the installation in 3 days and the system appears to be running well. I think they are a safe pair of hands if you are considering a foray into solar energy. An excellent company. Friendly, efficient, hardworking and good value for money. Panels put up in no time and working well. Just a note to say how pleased I am with my solar panel system installed by yourselves last week. Your installation crew could not have been a more pleasant group, polite, considerate, and very professional. The installation was carried out in the agreed two days and the site was left clean- tidy and all the rubbish removed. All of you have done a great job and it is working well - Thank you. I have just, April 2015, had an array of 12 LG panels installed by Cambridge Solar. 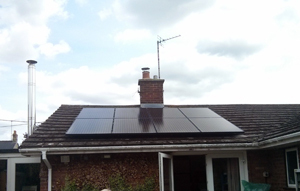 It is a 3.6kWp system with Solaredge invertor and the iBoost system to heat the water. What a wonderful experience throughout; from the initial visit by Owen, planning out to installation and hand over including the completion of the forms for the feed-in-tariff. I had researched the subject thoroughly and had a rough idea of what I wanted. Owen, who is extremely knowledgeable in the area of PV solar systems, shaped it into the final system and designed a very neat and nice looking package for a reasonable price. Very professional team of installers installed the whole system in 2 days. In the first day we’ve generated 25kWh, some of which was used to give us hot water for the whole day. The system is actually performing better than some of 4kWp system I saw previously. It was a great pleasure to do the business with Cambridge Solar! Highly recommend it to anyone who wants to dip his or her toes into the clean solar electricity! I would just like to say how please my husband and I have been with the whole process of having our solar panels installed. From the inital contact with Owen , to the electrian wiring up the system. All have been prompt, efficent and helpful throughout the process. Clean, tidy, and pleasant and we would recommend them highly. Having been considering Solar PV for a while, a recommendation for Cambridge Solar was the push we needed to get things moving. Throughout the process they have been professional, and Owen obviously knows his subject very well. The installation was quick and easy, everything was left neat and tidy and the wiring was kept hidden inside the house despite it being awkward. The system is performing better than expected, our first full month has seen electricity purchased reduce by 50% compared to the same period last year. We would thoroughly recommend Cambridge Solar. It was clear from the outset that Owen Morgan runs an excellent business installing pv solar systems. An onsite visit was arranged very shortly after the initial contact and everything was explained in clear technical detail and with great enthusiasm. Unlike other companies there was no hint of pressurised selling, just straightforward facts. The installation was carried out quickly and expertly and I was struck by how well the team worked together and how tidy and efficient their work is. Owen showed me how to monitor the system via the internet and so far it has been working at optimum efficiency. I am now looking forward to my first payment from my energy provider.!! I have no hesitation whatsoever in thoroughly and unequivocally recommending Cambridge Solar to anyone considering an installation of this type. After obtaining quotes from several installers, we decided to go with Owen because he seemed the most technically competent and also was genuinely enthusiastic about renewable energy. We are glad we did so: Owen's team were all polite, efficient and seemed genuinely nice people, too. Having just received our first quarterly payment, I'm even more pleased with the project! Just really nice people - not pushy, very efficient, very friendly and good value for money. Can't fault the experience, from first contact to installed up and running (and cleared away) in less than 3 weeks. I have not been disappointed with the quality of the service, equipment or the value of the work carried out by Cambridge Solar, under the stewardship of the articulate Owen Morgan and his friendly and efficient team. Everything was done with precision, expertise and attention to detail, and Owen took a close interest in overseeing and orchestrating the whole process from beginning to end, and made me feel reassured that he knew what he was doing. The LG solar panels he used were cutting edge technology, in that they were more efficient and easier to monitor than previous models, so that via an easy internet log-on protocol, you can clearly see exactly how each panel is performing, along with a whole range of other facts and figures, and of course, how much electricity is being generated. 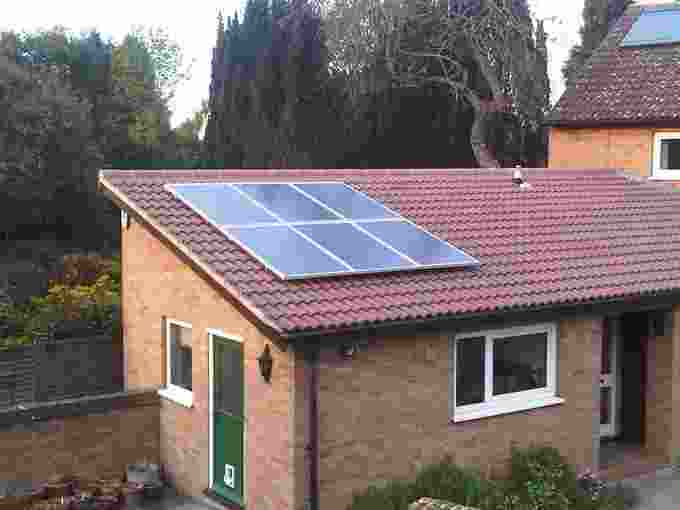 I am very pleased and satisfied with Cambridge Solar, and so I would heartily recommend them to anyone wishing to save a small fortune on their energy bills. Thank you! Solar panels fitted today; what a wonderful team you have. Friendly, courteous, tidy and quick! Most impressed. We are very pleased with our solar panel installation carried out by Cambridge Solar. One of the reasons we chose this company was the efficiency of the system they proposed to build. Our roof-line is not ideal for solar panels, but they made maximum use of it - and it looks very aesthetic. The installation was carried out on schedule in professional manner. The system is very well documented and clearly labelled in case any issues arise in future. We had a small “teething problem” a month after installation. They came straight away and fixed the problem on the day. We would definitely recommend Cambridge Solar as a company that delivers good quality, green energy generation systems and take great pride in their installations. Thank you very much for installing our solar panels so successfully and with so little disruption of our normal household routines. We would be very pleased to recommend you to any future customers as an exceptionally able, thoughtful and agreeable team. We were impressed by your communication skills, your willingness to explain the merits of your system without putting us under any commercial pressure and in general by your very professional work. As you are aware we obtained three quotations for the work we had in mind and yours was in all respects the best. Now that the work is complete we are happy to confirm that the confidence in you was fully justified. We had a problem with a PV system installed by a contractor no longer in business. The system was underperforming and the installers had previously told us there was nothing wrong. I contacted Cambridge Solar by email and Owen got back to me quickly by telephone to book a site visit. He turned up on time, found the fault and fixed it within an hour. He explained what he had done and showed us the impact on our inverter-generation meter. He charged us an entirely reasonable fee for a call out visit. It may be too early to say that we are now generating as we originally expected, but I am confident that Owen has fixed our faulty installation! d communications and an excellent job carried out by extremely pleasant, hardworking and professional personnel. "Very good experience all round. Careful, tidy and friendly workers. The system has generated more than was predicted in the first year. Very pleased!" First year FITS total £1058.70. Yay!!! Thank you Cambridge Solar! 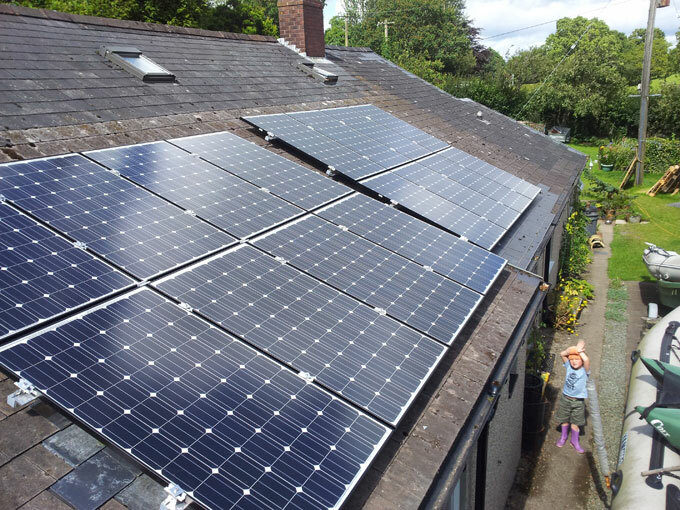 "Great team, I am really happy with my PV installation - just got a cheque from the electricity company...As far as I’m concerned and from an aesthetics point of view I’m extremely pleased with our solar panel installation. The panels are very sleek and I am proud of the system Cambridge Solar have installed. They were very efficient, no mess, no delay, just what I wanted....I am suprised to see that I’m generating more electricity than I am using! The panels even produce electricity when it’s cloudy. During the install I was also impressed at how easily the solar array fitted onto the roof, integrating with out any problems with the existing roof structure."